Transfer sagas between United and City seem to see no end in sight, as the bitter rivals appear adamant to lock their horns on all grounds possible. Having just seen a derby wherein the Red Devils emerged triumphantly, the focus was shifted to the potential of the two clubs fighting over a common target. That saga referred to the impending decision of Brazilian midfielder Fred, as to which club he would join in the summer with both the rivals in strong pursuit. However, along those very lines, another target has emerged, and this one is from France. As per a report in Paris United, Mancunian giants may attempt to sign PSG’s Adrien Rabiot this summer, in view of the fact that the player is out of contract in 2019. The source added that the clubs were ‘on the lookout’ over the possibility of him moving to England. This isn’t the first time an English club has sought to achieve his signature, with Tottenham being repeatedly linked with him in the past windows even before his rise to prominence. However, on each occasion, the 23-year-old Frenchman has sought to remain with his boyhood club. But things may change this time around, with his contract on the cusp of expiring, and he might consider a move to a foreign club. 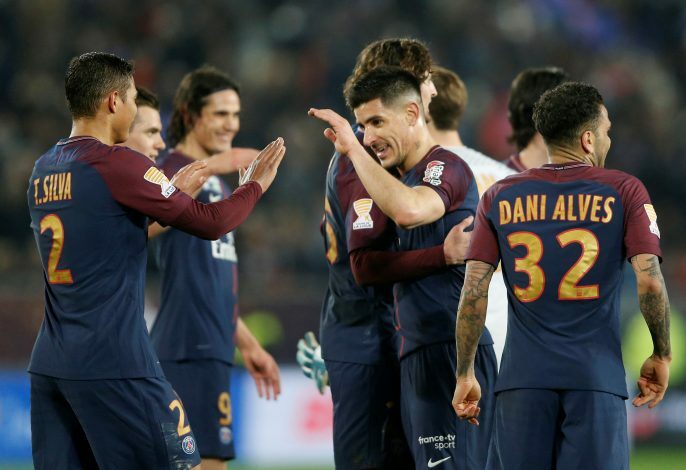 However, the same source reckons this is very unlikely, and has also reported that PSG are preparing a new bumper contract. This would indicate that the Parisians value him far too much and won’t let go of him easily. However, he certainly fits quite well in Jose Mourinho’s desperation for a midfielder in the summer window, and in view of potential exits and retirements, it may very soon develop into a tactical necessity than just a transfer requirement. City, on the other hand, seem to just fancy their chances, and are likely interested due to his proven ability and to reinforce their general area of interest, one that is already quite remarkable. Will the pull of Mancunian football finally emerge stronger than the love for one’s boyhood club?